Step 3: I agree to turn my will over to the “Higher Power” as I define it. While the Steps of Teen Addiction Anonymous were inspired by the Twelve Steps of Alcoholics Anonymous, they are not an adaptation. Rather they were created specifically for Teen Addiction Anonymous, and should not be construed otherwise. A.A. is a program concerned only with recovery from alcoholism, and is not affiliated with Teen Addiction Anonymous. Tokens are used to show a period of time that the individual has kept away from addictive behavior and are used to acknowledge this success. Whether or not the person has an addiction to alcohol, drugs, anger, etc., this period of time must also include being clean and sober. Teens must attend 3 meetings before they can qualify for a token. This shows that they are willing to make a commitment to the process of change. Tokens may be ordered by schools/organizations, which are trained and registered with Teen AA. Students may only receive one token for each time allotment. The tokens carry a registered trademark designed to symbolize the journey through any challenge. The design has several implications. The triangle shape of the mountains connect us with the original AA triangles on its token. The different sizes and perspectives of the mountains, symbolize each person’s journey. The sun represents hope that we all must find. 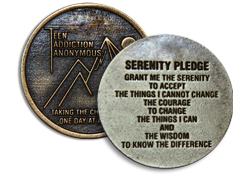 Teen Addiction Anonymous is written out so as not to confuse it with any other program. Taking the Challenge explains the journey that each of us needs to take through life. One Day at a Time aligns us to other 12 step groups and tells us to be patient as we go through life’s challenges.